James E. Boyd settled near here in 1858 and by 1860 operated a trail ranche supplying travelers on the Platte Valley Overland Route (Mormon Trail). The ranche included 200 acres of corn and barley. Nebraska Centre Post Office was here until if was discontinued in 1868. The Union Pacific Railroad, reaching here in 1866, ended the need for ranches. Soon after, Boyd moved to Omaha, was elected mayor and in 1891 became governor of Nebraska. 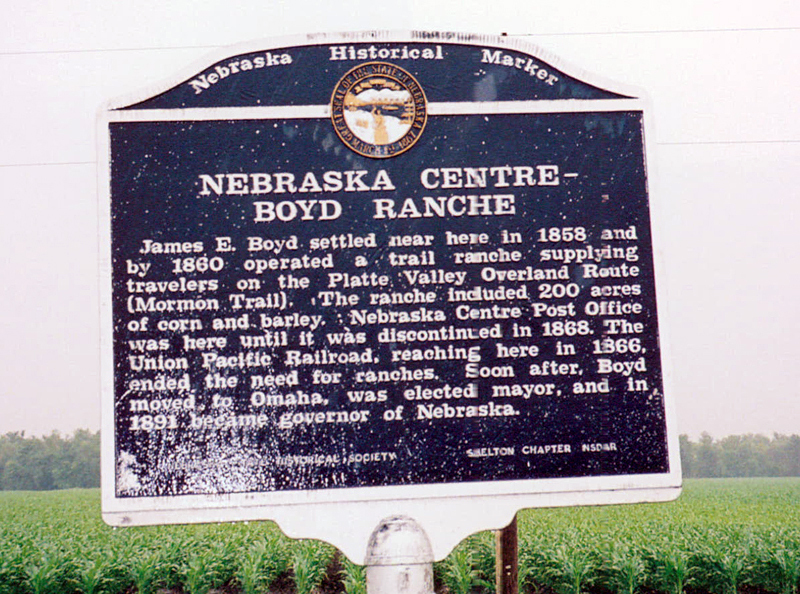 “Nebraska Centre - Boyd Ranche,” Explore Nebraska History, accessed April 18, 2019, https://mynehistory.com/items/show/32.